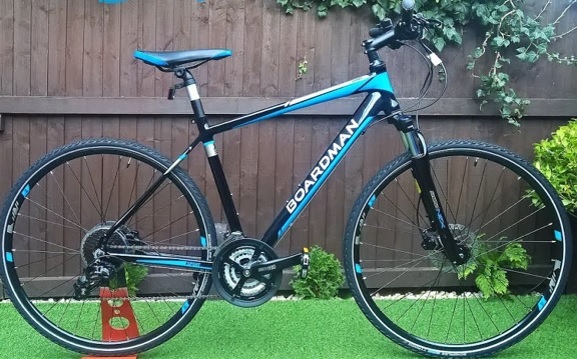 The bike colour was black with blue lines, had Defender XC11 MudGuards and Marathon Plus wheels. Bought from Halfords. The frame has a lot of scratches by the base of the handle bar as I carried stuff on it. It was in mint condition as back wheel also had green slime in it for punctures. Sadly I don't have a photo with it with the mudguards on but the attached photo is of the exact same model. It was stolen from right in front of my workplace despite it being locked up with a thick bike lock, the thief must have clipped it somehow. We have him on CCTV but he has no fixed abode so the police can't find him despite me having a clear shot of his face. Apparently he's responsible for other bike thefts in the area as well. Stolen from Cowley, Oxford. I uploaded two photos of the thief, on the first one he came here on his white bike then left with mine, then came back for his. He even escaped police recently, and, apparently he is responsible for a lot of other thefts in the Cowley area but has no fixed abode so they can't find him. He probably sells all of them for pittance.